His not-so-perfect fiancée… Emilio Andreoni’s goal is perfection: a corporate king and Italy’s most eligible bachelor, he craves only one more thing to complete his phenomenally successful life – the perfect woman! Once he thought that woman was shy Gisele Carter – until her scandalous goings-on became headline news and he called off their seemingly perfect engagement. But now Emilio is faced with proof of Gisele’s innocence! 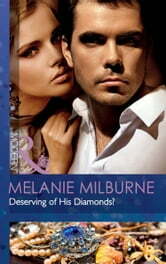 He’s determined to win back the only woman who ever truly satisfied him, but first he must persuade Gisele she’s worthy of wearing his diamonds again… Don’t miss this first instalment in Melanie Milburne’s The Outrageous Sisters duet!